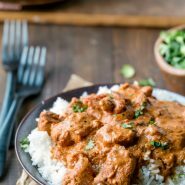 Indian Butter Chicken recipe that can be made quickly and easily in the Instant Pot. This rich spiced chicken and sauce makes an easy weeknight meal that’s perfect over rice. The beauty of takeout is that it’s easy. For us, the drive to grab takeout takes too long to be quick and easy. 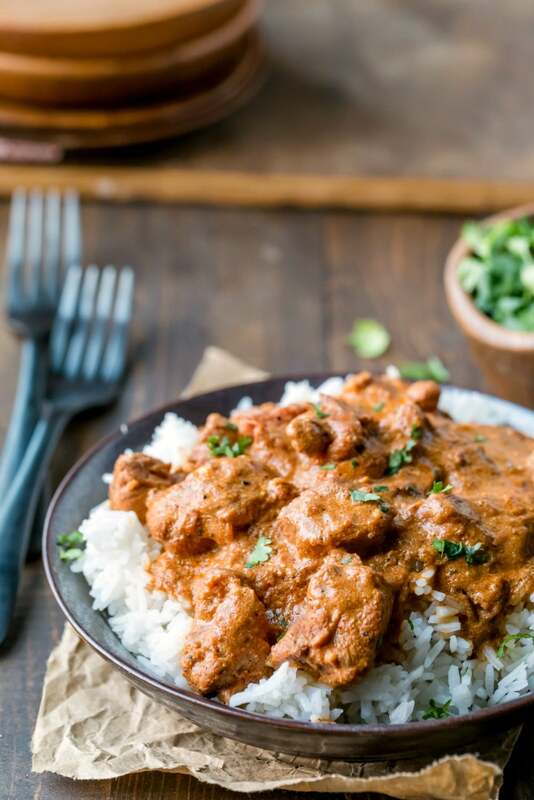 So, I need easy dinner recipes that are just as convenient and just as easy – like this Instant Pot Indian Butter Chicken. What is Indian Butter Chicken? Indian butter chicken, or murgh makhani, is a dish of chicken in a rich, spiced sauce. This shortcut version uses the pressure cooker to pack a lot of flavor in in a short amount of time. 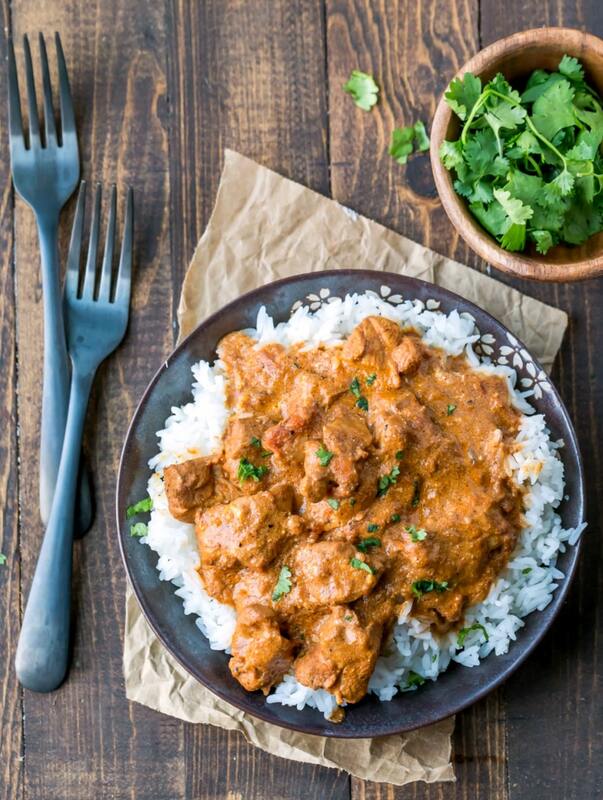 What goes with Indian Butter Chicken? This dish goes well with basmati rice and naan bread. I like to serve it topped with a little fresh cilantro. 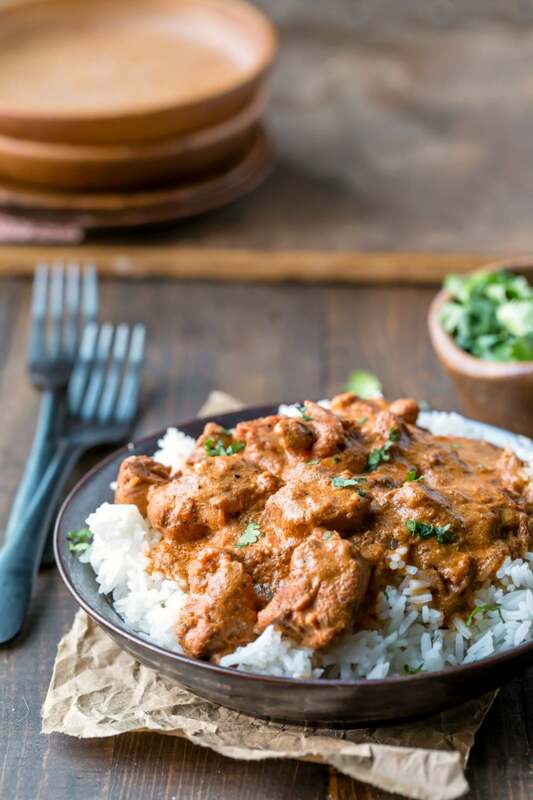 If you’ve tried this Instant Pot Indian Butter Chicken recipe, don’t forget to rate the recipe and leave me a comment below. I love to hear from people who’ve made my recipes! You can SUBSCRIBE to receive my latest recipe newsletters or FOLLOW ME on FACEBOOK, INSTAGRAM and PINTEREST for even more delicious food. Add 2 tablespoons butter, and let butter melt. Once butter has melted, stir in onion, and cook for 3 minutes. Stir in garlic and ginger, and cook 2 minutes. Add spices, salt, and pepper; cook, stirring continuously, for 30 seconds, or until fragrant. Add tomatoes, and stir in. Seal and cook 8 minutes on MANUAL. Stir in heavy cream, yogurt, and remaining 2 tablespoons butter. Serve over rice topped with fresh cilantro. *This recipe is not spicy. If you prefer the dish to be spicier, add more to taste. **Add up to 1/2 cup heavy cream if you prefer the dish to be creamier. Hello! 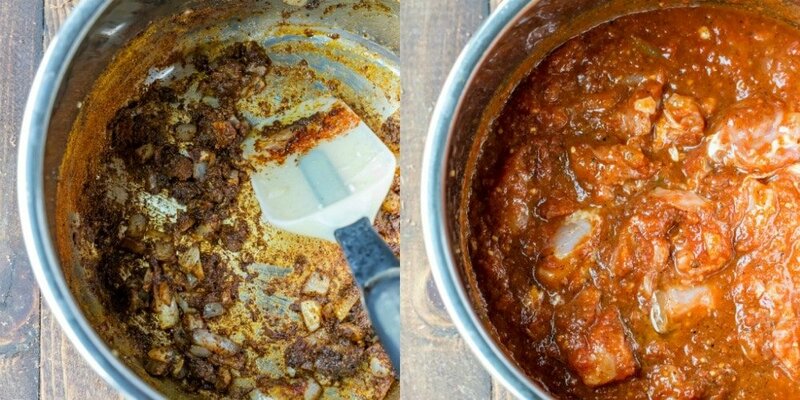 Can you double the sauce portion of the recipe in the instant pot? This was better than my local place! I can’t believe how good this is. Thanks for the recipe! Hi, is it possible to switch the heavy cream and plain yoghurt to greek yoghurt or it will change the consistency and flavor of the butter chicken? Using only Greek yogurt will change the consistency. It’s thicker than regular yogurt, and using it in place of both the yogurt and cream will give you a much thicker sauce. Are you looking for a lighter alternative to the cream? Thank you! I’m sorry, but I haven’t made this recipe any other way. I think cooking it (covered) on the stove top or in a slow cooker might work, but I haven’t tried it to say for sure or to offer cooking times for it. Thanks for the great recipe! I used a bit more cream because we like sauce extra creamy.